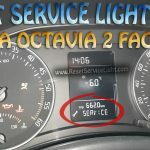 How to reset service light indicator Skoda Roomster. The distance which you have driven with your Skoda Roomster is shown in kilometres (km). In some countries the measuring unit “mile” is used. Press the button 6 for more than 1 second to reset the display of the daily trip counter. The daily trip counter indicates the distance which you have driven since it was last reset – in steps of 100 metres or 1/10 of a mile. If there is a fault in the instrument cluster Error will appear continuously in the display. Ensure the fault is rectified as soon as possible by a specialist workshop. If vehicles which are fitted with the information display the display of the second speed is activated in mph or km/h, this driving speed is indicated instead of the counter for the total distance driven. Resetting Service Interval Display Skoda Roomster. You can reset the service interval display by using the reset button 6. Never reset the display between service intervals, as this will result in the incorrect display. Information is retained in the Service Interval Display also after the battery of the vehicle is disconnected. If the instrument cluster is exchanged after a repair, the correct values must be entered in the counter for the Service Interval Display. This work is carried out by a specialist garage. After resetting the display with flexible service intervals, the displayed data is the same as that for a vehicle with fixed service intervals. We therefore recommend that the Service Interval Display is only reset by a ŠKODA Service Partner, who will reset the display with a vehicle system tester. Please refer to the Service Plan for detailed information about the service intervals. Push and hold the button B, for longer than one second. You can activate the Main menu by pressing the rocker switch A, for more than 1 second. Individual menu points can be selected by means of the rocker switch A . When the pushbutton B is briefly pressed, the information you have selected is displayed. The time, time format (12 or 24 hour indicator) and the changeover between summer/ winter time can be set here. The display of the second speed in mph or in km/h can be switched on here. That it is the full procedure how to reset service light indicator Skoda Roomster. If you like to reset any maintenance oil light after an oil change. Or reset check engine light, airbag light, inspection key or insp errors when maint reqd, for Skoda cars. Or any warning light for service reminder which appears on the display. Write in the search box the car name for which you want to find information, and find how to reset other service reminders by yourself. I wish to remove the inspection ISP with spanner symbol on my trip computer display, how do i reset this as my model Roomster 2010 1.6 petrol SE does not have a B button on the stalk. You can reset the service interval display on your Skoda Roomster from 2010 by using the reset button 6. I have a Skoda Roomster 2015. My garage cannot switch off the inspection warning, even after a service! I’ve tried holding down the zero. I’ve tried turning of hazards and holding down zero and turning the key. Hello Ben, do you have button 6 from the first image ? Hello Radu, you have the procedure in our article.